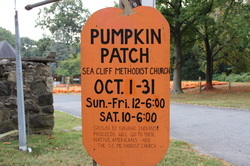 October 4 -- For the 10th consecutive year, the United Methodist Church of Sea Cliff is holding its Pumpkin Patch and Fall Festival Fundraiser. A week ago, volunteers unloaded 3,000 pumpkins and spread them about the church's lawn, creating a spectacular field of orange at the corner of Downing and Carpenter Avenues in Sea Cliff. The pumpkins were grown at the Navajo reservation in the four corners region of the United States, and proceeds from the sale will go back to the Navajo nation. The fundraiser is a community event in which volunteers of all ages have been on hand daily to help out with the sale. Sea Cliff School fifth grader, Javis Vermeersch has been a regular at the patch, helping carry pumpkins to the check-out table and to customers' cars. Both public and private school classes visit the patch where children not only pick pumpkins but are also read stories and taught lessons about Native-American cultures and history by volunteers from the community. In addition to a field of orange, visitors to the patch will also find gourds, cornstalks, pumpkin paintings, and homemade pumpkin pies, breads, cookies, and muffins donated by members of the congregation. There are also games and other fun activities for kids. On October 19th, the Church will be hosting its Pumpkin Patch Festival which will feature games, crafts, and contests, as well as an international food court and pastry cafe - and, of course, pumpkins.